I got back from VMware Partner Exchange (PEX) in Orlando early Saturday morning. After suffering AT&T (I see now why Americans are so excited about getting iPhone on a second carrier), I was keen to let the family know when I was going to make it home. I did the old ‘turn it off, turn in back on again’. No dice. Resetting the network settings didn’t work either. It was connecting to wireless just fine. I like to think of myself as someone who can fix these things, so I was getting a bit annoyed. 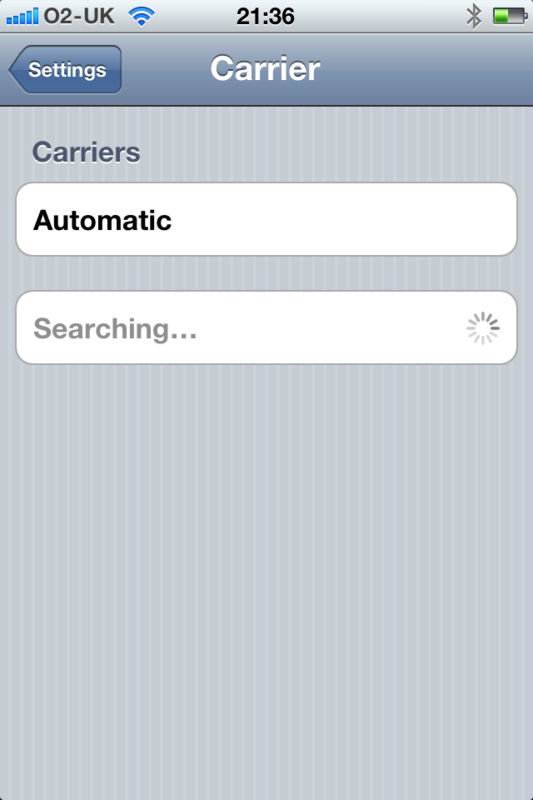 In my frustration, I tapped the ‘Automatic’ button under Carriers repeatedly, four or five times. As if by magic, up popped a list of the UK networks – I tapped O2 and there I was. This entry was posted on February 13, 2011 at 9:46 pm and is filed under Mobile devices. You can follow any responses to this entry through the RSS 2.0 feed. You can leave a response, or trackback from your own site.